Generalization is the ability of a model to perform well on cases not seen during the training phase. 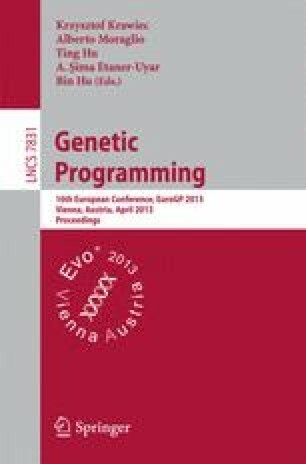 In Genetic Programming generalization has recently been recognized as an important open issue, and increased efforts are being made towards evolving models that do not overfit. In this work we expand on recent developments that showed that using a small and frequently changing subset of the training data is effective in reducing overfitting and improving generalization. Particularly, we build upon the idea of randomly choosing a single training instance at each generation and balance it with periodically using all training data. The motivation for this approach is based on trying to keep overfitting low (represented by using a single training instance) and still presenting enough information so that a general pattern can be found (represented by using all training data). We propose two approaches called interleaved sampling and random interleaved sampling that respectively represent doing this balancing in a deterministic or a probabilistic way. Experiments are conducted on three high-dimensional real-life datasets on the pharmacokinetics domain. Results show that most of the variants of the proposed approaches are able to consistently improve generalization and reduce overfitting when compared to standard Genetic Programming. The best variants are even able of such improvements on a dataset where a recent and representative state-of-the-art method could not. Furthermore, the resulting models are short and hence easier to interpret, an important achievement from the applications’ point of view.